The United Nations Volunteers (UNV) programme receives voluntary contributions from UN Member States and other funding partners. Their generous contributions and constant active support assist UNV to promote volunteerism and deploy UN Volunteers to aid its United Nations partners in delivering on their mandates. UNV highly values the commitment and support of its funding partners and counts on their continued support. 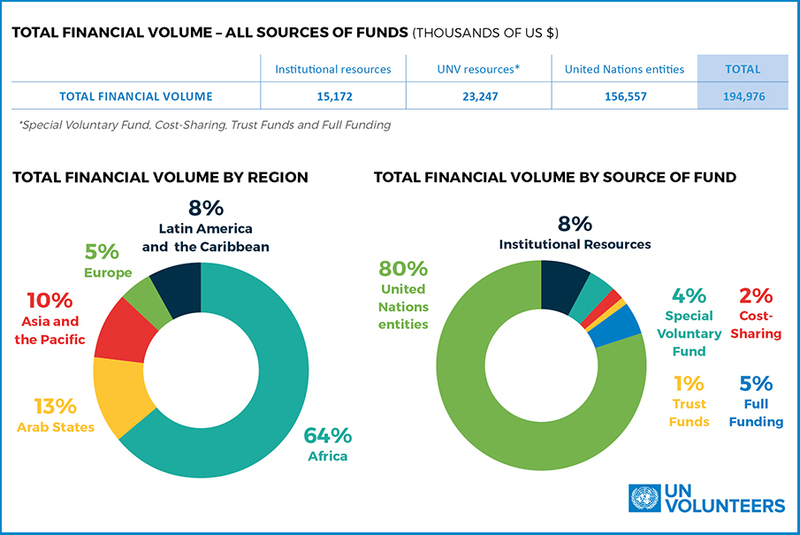 UNV financial volume; Annual Report 2017. UNV partners with the United Nations system and UN Member States in pursuit of peace and sustainable development, while ensuring greater inclusion and local ownership. Our funding partners are essential for UNV to mobilize a much-needed resource: dedicated and skilled people. From the seasoned and optimistic to the young and committed, UN Volunteers share their energy and skills with nations and communities around the globe through UN entity placements. UN Volunteers are a flexible and talented resource that ensure scale, impact and sustainability in peace and development interventions, including in crisis and post-crisis situations. UNV thanks its UN Member State partners for their generous contributions in support of volunteerism for sustainable development and peace and counts on their continued support. The graphic below shows UNV's funding partners, listed by magnitude of contributions received during the three-year period 2015-2017. Amounts indicated are in thousands of US dollars. When partners fund UNV’s work they can increase the visibility of their international engagement and promote people-centered development cooperation. In addition to broadening participation by supporting UN Volunteers in their field assignments, funding partners also assist UNV to uphold the value and global recognition of volunteerism. UNV receives contributions to its Special Voluntary Fund (SVF), an open non-earmarked UNV trust fund, from a diverse set of funding partners. UNV relies on contributions from a wide range of UN Member States and other partners to its SVF, which enable UNV to pilot and deploy volunteer solutions to the world’s pressing development and peace challenges. The SVF gives volunteerism a role in some of the UN’s most innovative development and peace projects and programmes to improve people’s lives, in line with the Agenda 2030 for Sustainable Development. During 2017, UN Member States contributed US $3,736,000 to the Special Voluntary Fund. Contributions were received from the governments of Germany, Switzerland, Sweden, Ireland, China, Germany, India, the Czech Republic, Turkey, Israel, Kazakhstan, Lao People's Democratic Republic, Bangladesh and Thailand. It is a testament to the solidarity and support for the power of volunteering that two of the world’s least developed countries (Bangladesh and the Lao People's Democratic Republic) and others from the Global South contributed to this special fund in 2017. UNV seeks to continue and strengthen its engagement with the current partners contributing to the SVF, as well as to increase the pool of contributing partners. Increased and predictable investments will enable UNV to further scale up and promote the impact of volunteerism and volunteers globally and in priority countries, while widening opportunities for marginalized groups through volunteering to leave no one behind. The UNV Full Funding programme provides UN Volunteers an opportunity to share knowledge and gain experience volunteering with UN projects and programmes. Through this sponsorship of assignments, partner governments contribute to international development and peace efforts and provide volunteers invaluable experience within the UN that they share at home and abroad.